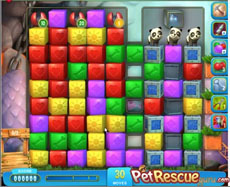 Our strategy for pet rescue level 264 is simple. Your task is to bring the line blasters with countdown in the proper line and at the right moment to destroy the boxes (solid grey blocks) under the pet. After that the completion of the level becomes quite easy. Watch the following video to understand our tactic that gave us a three stars score.